The original St.Andrew’s organ was built in 1933 in the Melbourne works of Hill, Norman & Beard (Aust.) Pty. Ltd. and incorporated part of a demonstration “Christie” Unit Organ. The organ was installed in 1934 and its electro-pneumatic action was one of the first of its type in Australia. In 1961 a new electric stop key console was installed. 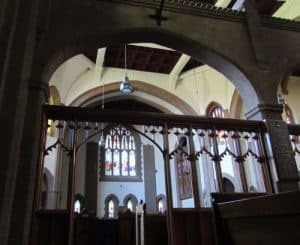 In 1964 it was decided to modernise and redesign the organ, both tonally and mechanically, and to divide it into two elevated organ chambers in the Choir transept. The contract for the necessary work was awarded to the original builders, Hill, Norman & Beard (Aust) Pty. Ltd. New direct action was fitted, not only for the switches and relays, but also for all pipe valves except those for the lower notes of the pedal which were electro-pneumatic. At this stage over 600 new pipes were added, bringing the total number to 1,140.